Feminist Futures is a lecture- and workshop series that runs September 21 - December 14 on Wednesdays 15-18h, at WISP, Birger Jarlsgatan 18. The series discusses feminist utopias/ feminist future images of a different society in feminist research, art and architecture projects, and lived utopias. Lecturers include: Karin Bradley, Ulrika Gunnarsson Östling, and Meike Schalk; Ramia Mazé & Josefin Wangel; FATALE; Ruth Morrow; MFK (Johanna Gustavsson & Lisa Nyberg); Yvonne P. Doderer; NBC (Annika Enqvist & Thérèse Kristiansson); and Annika Olofsdotter Bergström. FATALE prepares the Incompatible Modalities Salon:In response to the Irigaray figuration of the ”whirlwinds” caused by women diffusing ”themselves according to modalities scarcely compatible with the framework of the ruling symbolics” and the counter forces set in motion to restore ”their proper order”, FATALE invites all whirlwinders to a salon which celebrates this diffusion and its specific moments of articulation. The salon starts out from the conference location at the Bartlett with a walk to the Woburn Studios. At the Woburn Studios a conversational garden is shaped around ten ’fluttering follies’ each articulated by a distinct sound track, visual projection, and table-settings. What each participant brings to the scene in the form of individual clothing, body, actions, and conversational topics add to the formation and to the different nodes of talk and work formed in relation to each folly. Work produced by participants in the salon will be brought back to the Bartlett, as part of the Whirlwinds exhibition. FATALE contributors to the Incompatible Modalities Salon are Katarina Bonnevier, Brady Burroughs, Katja Grillner, and Meike Schalk. Engaged as contributors to the event are in addition Thérèse Kristiansson from The New Beauty Council, Stockholm, and Kim Trogal and Nishat Awan, both from Lines of Flight, the Agency Research Group, University of Sheffield. The Incompatible Modalities Salon is a contribution to the Whirlwinds session at the conference Sexuate Subjects: Politics, Poetics and Ethics at UCL, London. Dec 3rd, Bartlett School of Architecture, UCL. On Friday August 27th M.Arch Studios for 2010/11 is presented at KTH. Critical Studies Design Studio engages in critical and feminist strategies for the production of architecture and design. 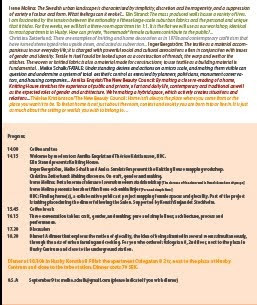 Subversive and dialogical design and research practices are applied to specific themes and/or locations in the four courses: Feminist Design Tools, Dialogical Interventions, Participatory Mapping, and Altering Practices. Throughout the design projects and in our seminars we engage in the notion of an altering practice, both in terms of understanding the change of existing conditions that each architectural project can bring about, and in terms of understanding how one’s own future practice as an architect can be conducted in such away as to actively engage in social transformation. Fatale participates in the workshop Feminist Futures / Feministiska Framtider, on May 10th. Katja Grillner gives a key-note address by way of introduction to the day. The workshop is organized at KTH in collaboration with Istitutet för framtidsstudier and Linköping University, by Ulrika Gunnarson-Östling, Åsa Svenfeldt, Tora Friberg, and Mattias Höjer. From the invitation: "Syftet med den här workshopen är att undersöka hur feministiska framtider skulle kunna se ut. Workshopen syftar även till att erbjuda ett nytt sätt att tänka och jobba med genusfrågor. När man tänker längre fram i tiden är det enklare att lösgöra sig från dagens strukturer och det som är personligt. Sverige sägs ibland vara ett av de bästa länderna i världen vad gäller jämställdhet, men att ställa dagens situation i kontrast till en framtid där könsstrukturerna är helt annorlunda kan göra det lättare att se vad som fattas idag." 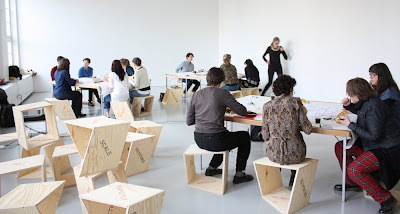 On April 26 2010, FATALE arranged an evening salon for a discussion on feminist theories and practices concerning architectures and power relations. This evening focused on non-western perspectives and critical accounts of Eurocentric conceptions of gender and space. Vad: En uppmaning att skicka in texter/projekt. Välj en text eller ett projekt av dig eller någon annan som ger ett annorlunda perspektiv på arkitektur än den eurocentriska/västerländska! Hur: FATALE salon med te och tilltugg. Var: Iaspis, projektrummet, Maria skolgata 83. Tema: Feministisk arkitekturteori med fokus på kritiska spatiala praktiker som ser bortom västerländska perspektiv. 2010 12 03-05 : Sexuate Subjects. 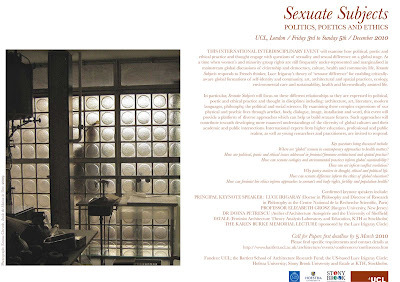 FATALE is invited to host a salon as keynote to the Luce Irigaray conference 'Sexuate Subjects. Politics, Poetics and Ethics', December 3-5 2010, at UCL, in London. IASPIS Residency 2009/10 (Katarina Bonnevier and Meike Schalk). During winter 2009/10 FATALE, through Katarina Bonnevier and Meike Schalk, will take up residency at IASPIS. FATALE is contributing to the 2009 Architecture Museum Yearbook with a whispering game initiated by a building and drawing by the Swedish architect Ingeborg Waern-Bugge. FATALE utvecklar en Masters studio och ett samarbete med Tensta Arkitekturskolan. FATALE Spring Salon 2009: Anthology Works was initiated by FATALE and produced in collaboration with Iaspis, Konstnärsnämnden, Stockholm, May 31, 2009. Special guests were Jane Rendell and Doina Petrescu. FATALE presented an architectural salon exploring and producing “feminist space”. Two collections of feminist writings in architecture theory were the point of departure for the event, bringing together editors/architects of these anthologies: Doina Petrescu, Altering Practices: Feminist Politics and Poetics of Space (2007) and Jane Rendell, Gender Space Architecture (2000). In dialogue with these, the participants in the salon were invited to project their thoughts and dreams into a future anthology – building feminism. The salon “Anthology Works” was the first of a series, which addresses the making of an anthology of feminist architecture theory and spatial practice. 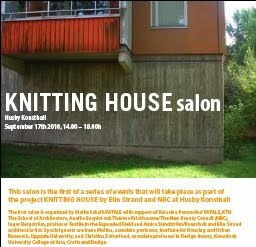 The salons open up to a public interested in getting involved and collaborating in this work together with FATALE. Project manager was Magnus Ericson, and project coordinator was Sara Teleman, Iaspis. Camera and editing by Tina Willgren. FATALE deltar i konferensen ’On Feminist Research Methods’. Inbjudan till presentation för Arkitekter i Sverige. Vad får man göra på stan?’ vid Stockholms Stadsmuseet. A yearbook from the first year of FATALE courses is being edited by this group (Åsa Lipka Falck, Suzanne Bergvall, Margareta Petré, Linda Lindstrand). Release Autumn 2009. FATALE besöker Ellen Keys Strand. Arbete med antologi inleds som ska samla feministiska arkitekturkritiska texter. Arkitekturkritisk teori: Gender I-III ges med nationella och internationella gäster (i samarbete med Stockholms Arkitekter): Ylva Habel (Stockholm), Elisabeth Meyer-Renschhausen (Berlin), Doina Petrescu (Paris, Sheffield). Architectural Inquiries, vid Chalmers Tekniska Högskolan, Göteborg. FATALE deltar i KTH-gemensam ansökan för Vinnovautlysning. Förberedelser av kurspaket Arkitekturkritisk Teori: Gender I – IV: föreläsningsserie I, experimentell skrivande II, litterär salong III, och studio IV. FATALEs kurser är öppet till studenter från ett flertal områden av alla nivåer samt praktiker. FATALE deltar i Feminism and Architecture Roundtable vid RMIT,Melbourne. Arrangerat av Helène Frichot med deltagare från Australien och Nya Zeeland. Arbete med programförklaring, grafisk profil, bibliografi och hemsida inleds. Kurser för läsåret 08/09 planeras. Kursen Jalusi (Arkitekturkritisk Teori: Gender I och II) ges. Gruppen FATALE grundas hösten 2007 av Katarina Bonnevier, Brady Burroughs, Katja Grillner, Meike Schalk, och Lena Villner. Gruppen är knuten till Arkitekturskolan KTH, ämnesinriktningarna Kritiska Studier Studio och Arkitekturens Teori och Historia.